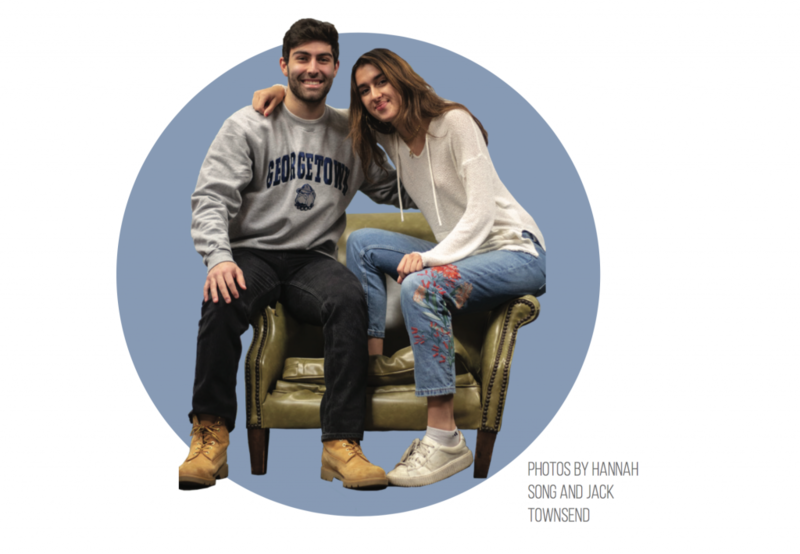 The Voice editorial board has decided to endorse the Sina Nemazi (COL ’21) and Roya Wolfe (SFS ’21) ticket for GUSA executives. They’re good candidates, especially with Nemazi’s GUSA experience, Wolfe’s clear passion, and their actionable policy proposals. But they’re not perfect: Their proposals need improvement, and Nemazi’s debate appearance left much to be desired. After a turbulent year in the GUSA Executive, this editorial board was looking for a ticket that would restore trust and hope in our student government. This year, we find the four tickets underwhelming, but not hopeless. Three out of four tickets display a genuine care for the student body and a passion to bring change to campus. Yet, across the board, the candidates lack a fundamental understanding of how to advocate for students through the institutional limits of GUSA. The legitimate passion of Nicki Gray (NHS ’20), Norman Francis Jr. (COL ’20)/Aleida Olvera (COL ’20), and Sina Nemazi (COL ’21)/Roya Wolfe (SFS ’21) was clear. Therefore, in evaluating the tickets, we made our decision based on three standards: the candidates’ clear priorities, concrete ideas, and institutional knowledge. For those reasons, we are endorsing Nemazi/Wolfe for GUSA Executive. Nemazi and Wolfe have outlined six priorities for their campaign, each backed by a specific, measureable proposal. These include responses to campus sexual assault, dining improvements, and socioeconomic accessibility. We do not believe that all of the ideas they have put forth are necessarily the best ones to tackle these issues. However, the candidates grasp GUSA’s fundamental limitations, have the self control to prioritize achievable solutions, and give a way to hold the executive accountable for their promises. GUSA candidates often get caught up in promising a wide swath of ambitious yet unspecific reforms, only to disappoint the student body after a year with nothing tangible to show. Nemazi is the only candidate to have any experience working in GUSA. While being a GUSA “insider” is not one of our requirements, understanding how GUSA functions before becoming its executive is. We were not impressed with other tickets’ promises to generally figure out how GUSA works when elected by relying on others with more experience. Nemazi’s background as the dining committee chair means he and his administration will require less time to get acclimated and have more time to get to work. What we were truly impressed by, however, is the passion and energy Wolfe has brought to the ticket. Although she still has a lot to learn when it comes to institutional knowledge, we were more inspired by her genuine dedication to campus causes, particularly supporting sexual assault survivors and expanding access to free menstrual products in campus bathrooms. Nemazi has much room for improvement in his public speaking skills—his appearance in the presidential debate tended towards confrontational and abrasive—but Wolfe is persuasive and passionate, and we believe she will be a good representative for the students to the administration. Nemazi and Wolfe also seemed to be the most in sync team: in their interview with the Voice, they only needed one glance at each other to answer in unison that sexual assault prevention was their top priority. They conveyed an ability to accept constructive critiques of their platform and were the only ticket that demonstrated they had researched the financial limitations of their proposals. Of course, the GUSA executives will have to rely on the expertise of others to create change on campus, but they must also have a clear vision and priorities to effectively guide their administration in any meaningful way. Out of all the tickets, Nemazi/Wolfe make their priorities clearest while also understanding that GUSA is a way to both consolidate student advocates’ current work and cut out redundancy. That being said, Nemazi/Wolfe still have work to do to make their existing ideas actionable. They have received criticism for their plan to train Student Advocacy Office representatives as a support system for sexual assault survivors and need to spend more time with advocates versed in interpersonal violence before setting this in motion. Furthermore, we believe they should expand their focus to further balance sexual assault prevention as well as response. We appreciate that Nemazi/Wolfe, in response to criticism, have emphasized their “Zen Den,” a student self-care space that would replace an underutilized graduate student lounge in Lau, is not a solution to mental health issues on campus. Yet they are attempting to creatively work within GUSA’s limits to improve student life. Through this initiative and their sustainability goals, they have shown originality and a willingness to put forward specific ideas, even if those ideas need improvement. They should continue reaching out to and incorporating critiques of their positions. We do believe that Nemazi/Wolfe should publicize their stances on a wider range of issues. We commend them for consolidating their main points and appreciating that their policy chairs will tackle a full range of issues outside these six. However, it’s important for students to know where they stand on issues of relevance to them, including LGBTQ rights and religious inclusivity, so they can be assured that the ticket will support their interests. Francis Jr and Olvera also make a great, balanced team. Their support for each other as candidates and as friends is admirable. 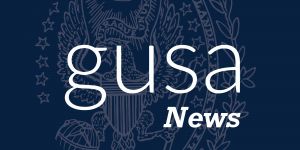 The pair have a broad platform and range of ideas, and it was comforting to be able to see where they stand on all of GUSA’s policy pillars. But despite their overarching slogan—“Transparency, Reform, Accessibility, Progress” (T.R.A.P. )—their priorities do not seem focused. They do have some actionable goals, but we fear that they would spread themselves too thin as executives. Furthermore, during their interview with the editorial board, they were not able to articulate the specifics of those goals when we asked. Simply reaching out to student groups is not an acceptable policy to begin an administration. These efforts should be made well before an executive takes office. In addition, their overreliance on more experienced members of their team to drive policy sparked concern. The ticket’s lack of institutional knowledge is troubling, as exemplified by their last-minute decision to run, which they seem to laud as an asset rather than a liability. If Francis Jr/Olvera had a better grasp of the functions, structures, and realities of GUSA, they would have had the potential to make a more compelling executive team. Gray performed very well at the presidential debate, clearly outshining the other candidates. She is well-spoken and passionate about the issues that make up her platform. We also admire her resilience in continuing a solo campaign after her former running mate dropped out. However, during her interview with the editorial board, she was unable to give us actionable policy proposals or name specific characteristics she was looking for in a potential vice president. She instead expressed hope that students would trust her to make the right decision on who she appoints, but this left us more unsettled than reassured. Additionally, we believe she should have released her full platform all at once as opposed to gradually rolling it out, which raised concerns for us with regards to her transparency and preparation. We were initially worried about her knowledge of GUSA, although by the debate she had greatly improved. In the end, though, she fell short on specifics. Zuccala and Dolan have demonstrated a lack of interest and commitment to their campaign, as shown by their absence from the campaign kickoff and Dolan’s failure to attend the vice presidential debate. The pair seem more concerned with condemning GUSA as dysfunctional than actually learning about its functions. 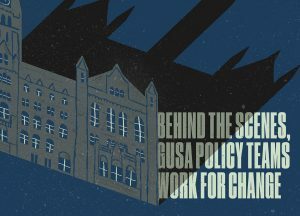 If they’re going to make GUSA transparency a focus of their campaign, then they as candidates have a responsibility to study its inner workings and convey that information to students, rather than simply complaining about it and spreading false claims. Throughout campaign season, one thing has become abundantly clear: the women are driving the tickets. Gray, Olvera, and Wolfe provide the spark and direction to each candidacy and individually make the most compelling leaders. These women clearly demonstrate that all of their tickets have a genuine care and passion for the issues they prioritize, and if elected, will better student life. For future GUSA candidates, we hope you spend the time before the campaign to talk to students, understand how GUSA works, and give credit to those who have been working to solve the problems you include on your platforms. Present well-researched, creative, and tangible policies for the student body to hold you accountable. The women on this year’s tickets were the most inspiring part of this campaign season, and we hope to see more women vie for president next year. In light of the posting of “Abolish GUSA” signs around campus, and this editorial board’s own opinions on GUSA, we as students are frustrated with the lack of transparency and inefficiencies within our student government. However, if we want to change this, it is up to the student body to educate ourselves about our leaders and institution and engage with them. While we are not thrilled with any of these tickets, all but one have shown they sincerely care about the student body and will do an acceptable job as executive. We implore everyone to vote for your next GUSA executives on Friday, Feb. 8.